In Light Industry operations, cost flow can be realized by processing waste flow into Geotube® containers as opposed to lagoons. Geotube® containers can add capacity to existing drying beds by making the drying operation more efficient. Containers can even be stacked on top of each other for more capacity. The Geotube® solution also assists with the odour implications of waste material holding. Once the dewatering process is complete, the Geotube® container can simply be opened, and the contents hauled away. For many industrial applications, dewatering is a necessary process that costs time and requires expensive and complicated equipment. But thanks to the Geotube® Solution, there is a cost effective way to perform dewatering. 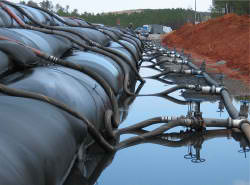 The Geotube® Solution can be a temporary or permanent solution to your waste treatment needs. Geotube® technology can be sized to meet the needs of each industry individually, whether the operation requires a great amount of capacity, or whether the facility performs dewatering once every quarter. 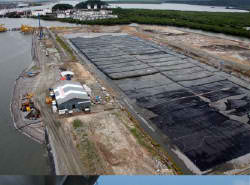 Geotube® technology further helps when a company expands, or out-grows their lagoons and drying beds. 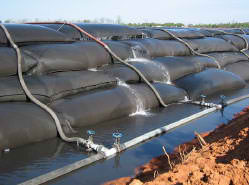 Geotube® containers can provide a quick lagoon cleanout, or add capacity by making drying beds much more efficient. Geotube® containers can also be stacked on top of each other, adding to further capacity.